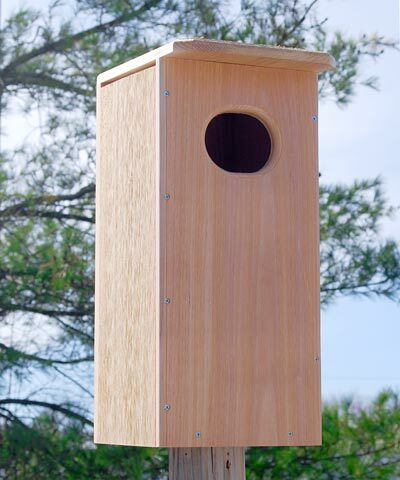 Help elusive wood ducks find a nesting spot using the Looker Products Wood Duck House. These colorful waterfowl prefer to nest in cavities, but are unable to excavate one on their own. Offering them a roosting box helps them increase their populations. This significant unit has a 3.5" tall by 4.5" wide, oblong entry hole, and its deep design helps protect the eggs from predators. Place some of the included bedding material inside the home to help the duck create a comfortable and safe nest for her eggs. A ladder on the inside of the box helps nestlings reach the opening when time to exit, and the roof overhang protects the interior from rain. Ventilation gaps at the top of the unit aid in regulating the internal temperature, and small openings at each corner of the floor provide drainage. The side panel lifts upward in two spots for nest checks and cleaning, while two included square bend rods create latches to keep them closed. Attach the included, wooden knob to the large side panel to easily open it as needed. The western red cedar construction ensures a lasting house which is naturally resistant to decay, for you to enjoy the ducks season after season. Use a mounting bracket (not included) to place this home on a post or pole, situated near the water for optimal occupancy chances. Offer wood ducks a private roost with this Wood Duck House, and enjoy their lovely plumage. Made in the USA.